Posted 4/25/2018 10:13am by Sam Bellamy. Mike will be at the ICI market with lots of strawberries and a very good supply of organic strawberries. Lots of organic lettuce, kale, mushrooms, greens, some chard, asparagus and onions. Next week Sarah returns. She will be at the Myrtle's market next week when it opens on Wednesday. Posted 4/24/2018 5:49pm by Sam Bellamy. Wednesday the PYO fields should be open at 8 am and we are trying to go well into the afternoon. Pre-picked is available also. If you want organic berries or lettuce, radishes, onions, kale , etc. please let know ahead and I think we can have it for you. Posted 4/22/2018 8:30pm by Sam Bellamy. Monday looks like rain. We will have pre-picked berries available at the market. So you can still enjoy strawberries even on a rainy day! PYO may open Tuesday or Wednesday. Posted 4/18/2018 12:14pm by Sam Bellamy. Thursday , Mike will be at the culinary market with lots of strawberries, lettuce, onions, radishes, and other veggies from the farm. He will have some micro-greens, mustard greens. At the farm Deb will be selling strawberries pre-picked at the farm market from 8 to 12. Friday the PYO field will be open at 8 am until 12. Saturday the PYO field will be open at 8 am until in the afternoon. Posted 4/16/2018 9:40pm by Sam Bellamy. Strawberry field will be closed Tuesday. There will be pre-picked berries available at the farm market. Wednesday looks likely for PYO. We will know by late tomorrow. Posted 4/16/2018 5:17am by Sam Bellamy. Strawberry field will be closed Monday. There will be pre-picked berries available at the farm market. Posted 4/12/2018 9:14pm by Sam Bellamy. 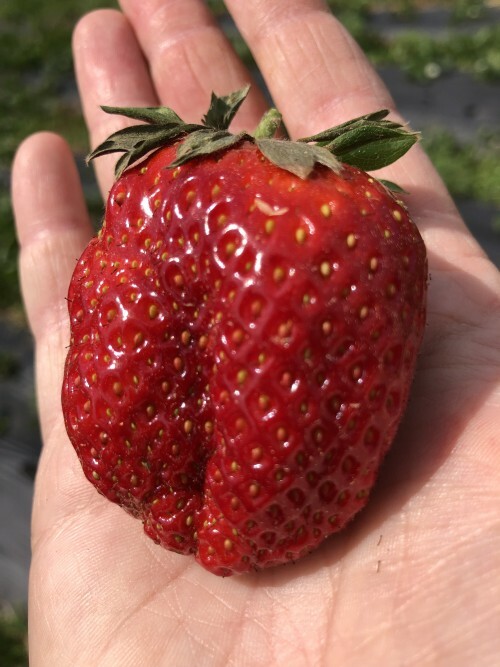 The PYO strawberry field will be open Friday until we think that section is picked and reopen Saturday mornings at 8 am. until likely into the afternoon. Pre-picked berries ,lettuce , radish, onions will be available at the farm market. Posted 4/12/2018 5:35am by Sam Bellamy. The strawberry field is open today. There should be some pre-picked berries at the cart in the field. Mike Malloy will be at the Culinary Institute in place of Sarah. He will have strawberries , onions, lettuce, radishes. Mike will fill in for Sarah while she is helping with the grand baby. We are very thankful for his help. Posted 4/9/2018 8:38pm by Sam Bellamy. The flavor of the berries has improved but the field is still very wet. Hopefully the sun will get through and begin to dry things out. Meanwhile we will have some pre-picked berries at he market about 9:30 am. We are pulling some beautiful radishes and lettuce as well. We plan to have the field open tomorrow. ( Wednesday) at 8:00 am. Posted 4/8/2018 10:29pm by Sam Bellamy. The weather has not been good for strawberry picking. The field is wet and today the berries had very little flavor. Therefore we will not open the field Monday but Tuesday looks better. The weather is supposed to have warmer nights a couple of days from now which with sunshine is what we need to get the fruit back to quality. With the pre-picked berries on Tuesday there should be some spring veggies as well.